I'm so excited because today is M3 (Mixed Media Monthly) release day at The Lilypad and this month's release is A-MAZING!!! I have a major thing for maps and travel type kits and this one is just GORGEOUS!!! Also, I have a fast play video showing how I created this page up on The Lilypad blog if you want to see how this page was created. I had fun putting this together and using my One Little Word® again. 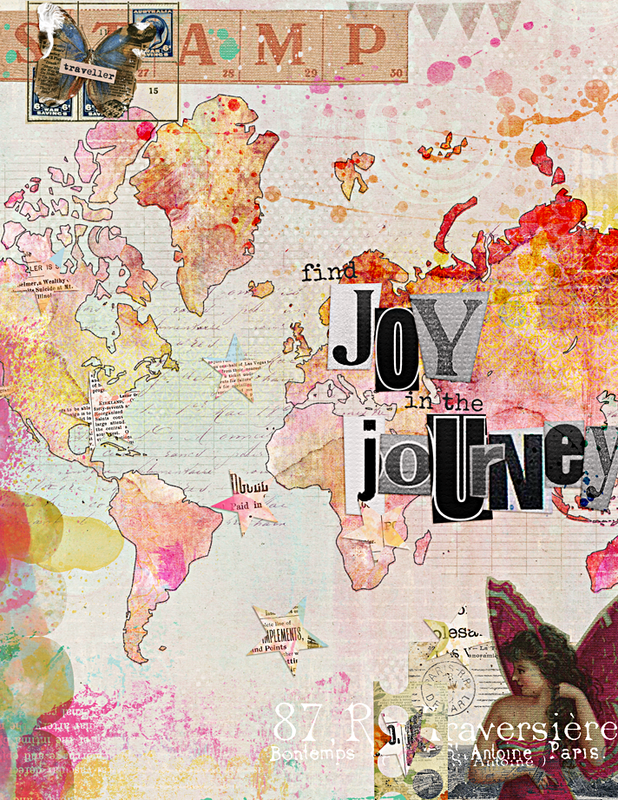 I thought the phrase "Find Joy In The Journey" was just too perfect for the theme of this kit. Seriously, I could probably do a dozen pages with this kit, I love it so much! Anyways, I wanted to share it with you, and I also wanted to let you know that I'm sharing a process video on The Lilypad's blog in case you want to see how I put this baby together. I can't wait to print it out and hang it on my wall above my desk!